Losing your driver’s license may be one of the penalties for a DWI conviction in North Carolina. That’s why it’s so important to hire an experienced DWI defense attorney like Bill Powers of the Law Offices of Powers Law Firm. As a Board-Certified Criminal Law Specialist by the National Board of Trial Advocacy, Bill Powers focuses a substantial amount of time and effort into the defense of this area of law and understands how losing your license can affect your life. Depending on the circumstances surrounding your case, one option for keeping you on the road may be the installation of an ignition interlock device. The ignition interlock device requires you to first blow into the device before it will start your engine. The ignition interlock is supposed to detect the existence of any amount of alcohol in your breath, although it is by far an imperfect science. Presently, there are three vendors authorized and/or recognized in North Carolina to install and monitor drivers. If the device detects alcohol on your breath, or more, it will prevent you from starting your vehicle. If you are driving at the time, it will track the “positive” reading and set off an alarm of sorts. That may include an automatic, repetitive sounding of your vehicle horn and flashing of lights. Needless to say, law enforcement in North Carolina are trained to look for vehicles. They are very much aware of how the Ignition Interlock Device works, what it does to the vehicle to warn other motorists and essentially assist in the detection by police a potential violation of a suspended, revoked, or conditionally restored license to drive predicated on the abstinence of alcohol. The National Highway Traffic Safety Administration and the State of North Carolina have set standards for the ignition interlock devices; those that meet their standards allow for a running or rolling retest. This while driving, on a purportedly random basis, you’ll have to again blow into the machine to make certain there is no alcohol in your breath. This was created to curb other friends and family members from blowing into the machine for a driver simply to start their engine for him or her. As technology has progressed, these machines have become increasingly accurate, less subject to error, and can in some instances actually provide geometrics to law enforcement. A positive reading on the ignition interlock, if obtained during a rolling or running test, will cause your horn to honk in an alarm fashion and may also cause your headlights to blink on an off. Obviously it would be dangerous to just shut off your vehicle in the middle of the road. The purpose of the blinking lights and honking horn are to draw the attention of other motorists, which may also include the police. That may be reasonable suspicion for the police to stop your vehicle. 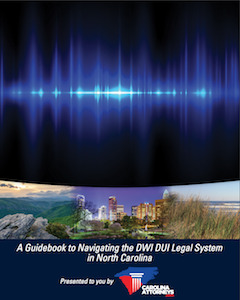 Ignition interlock devices (for the most part) make both the state of North Carolina and those accused of DWI happy — the state doesn’t have to worry about the person driving drunk and the driver may have the opportunity, given certain legal prerequisites, to continue driving to work. However, you should know that the ignition interlock device will be installed in your vehicle at your expense (another reason why the state likes this program…it doesn’t affect tax payers). The maintenance fee can be considerable. In North Carolina, you will be required (at minimum) to go to the facility for maintenance and a “datum dump” where every attempt to start your vehicle is recorded via an onboard computer. That information is sent to the Department of Transportation/Division of Motor Vehicles (DMV) for review. If it is determined that you have positive readings, you may be subject to revocation of your license. In certain circumstances, evidence of positive readings could affect a suspended sentence by the court if you have been ordered to refrain from any drinking or associate with people known to have consumed alcohol. Interested in learning more? Contact DWI defense attorney Bill Powers. He can start building your defense and can discuss whether or not the ignition interlock may be required. Hi, This is Bill Powers. I’m talking to, on our website, regarding this page, Ignition Interlock Device. I’ve got one in my hand right here. Sometimes people refer to these as the blow-and-go. Lawyers may say the IID, the ignition interlock device. 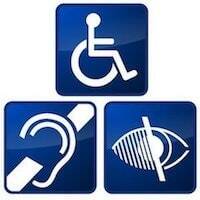 If you want to know more about the specific devices, I encourage you to check out our website. 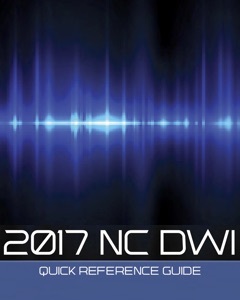 We’re going to have a link probably down below where this video is, possibly up above, to our link to our publications called North Carolina DWI Quick Reference Guide. It’s on SlideShare. It’ll have all the different devices. Presently, right now as we sit here, there are three different companies that are authorized by the state of North Carolina. There’s a little cord that comes out of the back of these things and you hum. Som of them have you blow, historically, but now it tends to be more humming-related. It reads a sample and before you could even start your car, the ignition interlock, if there’s any alcohol sensed, that won’t let you start your car. As you’re driving, it may give you a random, or what they call a rolling test to see if maybe you had someone else help start your car. It’s really, really, complicated. It’s really interesting scientifically, but these things are not evidentiary level in court. We don’t often times see them for, say, prosecution for driving while license revoked, or something like that. They are relevant to DMV. You have a positive on one of these while you’re in a period of revocation or suspension, or if you’re on an ignition interlock limited driving privilege as a post-conviction remedy, or some sort of restoration process of DMV, it’s a big deal. The science is very, very important because you actually have to start looking at what it was reading, how it was reading, timing of the reading, things of that nature because if you’re going to get your license revoked even more, and heaven forbid, if you’re on a limited driving privilege and the judge thinks you’re drinking and driving after the fact, that’s, as we say in the business, no good. They’re complicated. There’s a lot of science that uses the same fuel cell that we see even in the Intoximeter. This is the handheld Alco-Sensor device. When I say the same fuel cell, these are actually competing companies. I’m referring to the science itself. I’m sure that they have their own individual cell. Maybe this one’s square and this one’s round. I don’t know, but they work the same. Fuel cells have been around for 400 years. They’re basically a battery. If you have questions about this, if you have an issue with the ignition interlock device, when does it have to be installed? Is it part of a plea? Is it part of the court judgment? Is it part of DMV? Give me a ring. Telephone number, 704-342-HELP. That’s what we’re here to do, help you out.